Many people are asking questions about voting during the upcoming Federal Election in Canada. I took notes from questions being asked on various social networks and media outlets. Most, not all, of the information written here is from Elections Canada and the Government of Canada websites. It is meant to take the confusion out of making your vote count. Changes were made by the Harper Government to the Elections Act. We can work around the changes meant to derail several million Canadians from voting by being informed. Contrary to media hype there are millions of Canadians who do not have Internet access. It is therefore necessary for those who do have access to pass on the facts on how to vote. Charities, non-profits and other organizations should mobilize volunteers to assist in the voting during the election. Political parties, by law, are also allowed to take people to the correct Polling Station. Technically they are not to use the drive as a way of influencing your vote. One of the major concerns is finding out if you are registered to vote. Anyone over the age of 18 is eligible to vote in Canada. The Elections Canada website is available in English and French. Every citizen of Canada with Internet access can find out if you are registered by going to the Elections Canada website. It is open and available for every computer and device. For those without their own computer you can use the local Libraries or any support group with a computer. The website addresses privacy concerns and shows you how to clear the browser history. You as a citizen, with Internet, have every right to help friends and family make certain they are registered. It is simple to register at the Elections Canada website. Please share your knowledge by helping another Canadian citizen to vote. 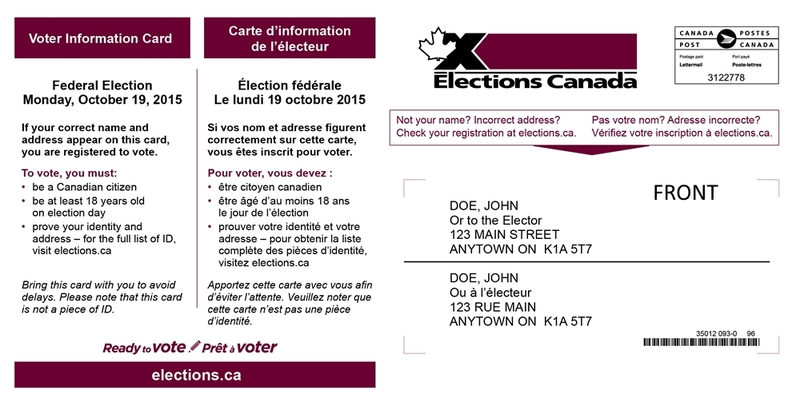 For those registered a Voter Information Card will arrive at the address Elections Canada has on file. A good reason for everyone to check their status and update your address if required. The Voter Information Card is no longer a valid piece of identification. A few new, rather convoluted steps are required, for Aboriginal Peoples from coast to coast to coast. Information can be found here for you to read. My take on the changes is simple. It is about as close to requiring a lawyer to witness your vote as possible. You can thank the Harper Government, by voting, and be assured you are not alone. Elections Canada offers several Aboriginal languages for the documentation. Another initiative by Elections Canada was implemented to let voters use Friendship and Youth Centers to offer additional service points where people can get information, register and vote. You can search locations with your postal code. Elections Canada is opening offices at several College and University campuses across the country as a pilot project. I am asking students in Universities and Colleges to post the information everywhere possible. Student Unions along with other College and University organizations can make the voter turnout the highest in Canadian history. Elections Canada launched an Advisory Group for Disability Issues to provide advice on initiatives for the 2015 Federal Election. The group helped identify the best ways to inform people with disabilities of when, where and the ways to register and vote. Elections Canada continues to draw on this network of organizations for consultation purposes. These organizations also assist Elections Canada in spreading the word about elections to their networks of people with disabilities across Canada. Voters have an additional option by using a mobile Polling Station in some residences and hospital wards. Elections Canada personnel, if required, will carry the ballot box from room to room for voting. Ask your facility administrator or call Elections Canada at 1-800-463-6868. Do you find the article useful and easy to understand so far? Great! Post it everywhere because the next section is where the fun begins. The Harper Conservatives must have gathered a large group of corporate lawyers together in order to trick Canadians out of a vote. It is an obvious attempt to defraud Canadians at the Polling Stations and destroy the right to vote. The result of fake phone calls made during the last election by the Conservatives sending Canadians to the wrong Polling Stations. Harper and the Conservatives want to get even by further damaging the right to vote. Listen, I understand many of you, have a busy life tending to your own difficulties and successes. Could you find a few minutes to vote and ensure another Canadian the same? The first one is mandatory and could be difficult for millions of Canadians. Canadians of 60+ years make up 7+ million of our population with an estimated 4 million no longer having a valid drivers license. Students and people without a fixed address will so find it difficult to vote. Of all the voters during the 2011 election 400,000 of 900,000 people used their voter information cards for identification. 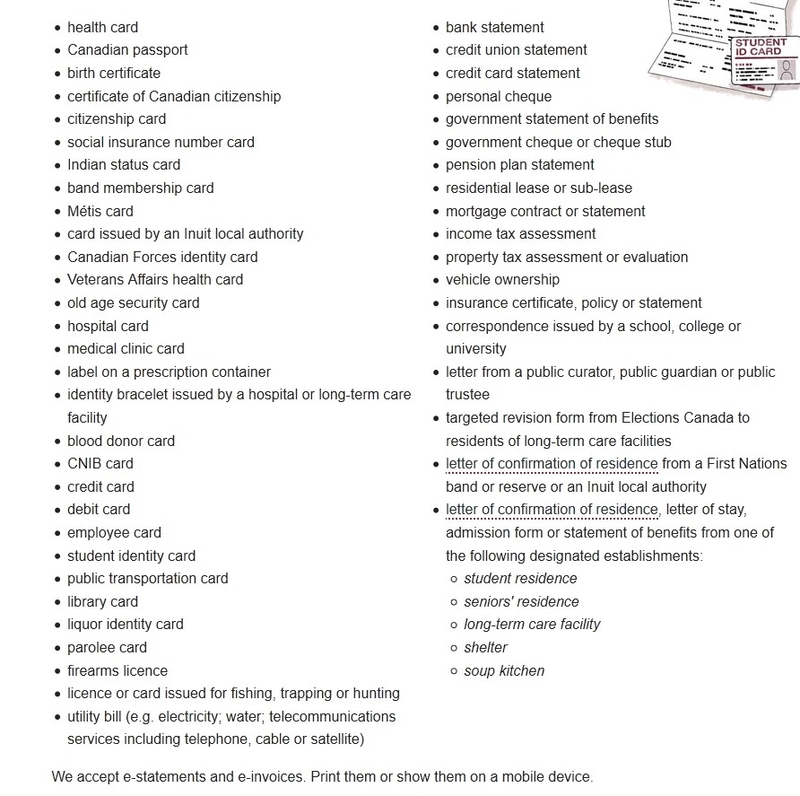 Elections Canada information cards are no longer valid nor is a passport. Once you have hurdled part one of the test a second part is required. Two pieces of identification as show in the diagram are required. I am writing about the Canadian election this October 19, 2015 in case you are feeling I am making this up. Harper and his Conservatives put more roadblocks on your way to vote in a society that is supposedly an open Parliamentary democracy. For the homeless Harper put more bricks in the wall. Charities and non-profit agencies can play a big role by vouching for homeless Canadians. You already do offer so much dedication and now you are being asked to go one step further. Canadians traveling, living abroad and our Armed Forces will find information at the Elections Canada website. Sign up for notices on the Election Canada website as additional resources will be added. Help put Canada’s reputation where it belongs near the top of all nations. Posted on September 12, 2015 September 24, 2015 by Dennis CamblyPosted in Canada, Canada election 2015Tagged Canada election, how to vote, resources, voting.identification.